This movie is part of the Czech film box set from Second Run DVD. I have to say that for a good while, the script seemed to me disjointed and anecdotal, and not in a good way. 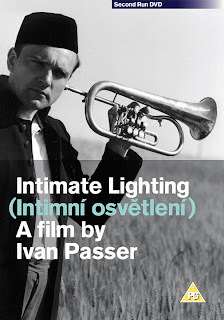 The story mainly features these two musicians who have known each other long ago, but are now in very different circumstances: one is provincial family man Bambas with parents and several children, the other is Petr, a townie with a gorgeous child-woman girlfriend. Petr is called in to play with Bambas and the other provincials at an important local concert, and during this time he and his girl stay over at Bambas' house. So most of the film obliquely hints at the differences between the circumstances and outlooks of Bambas and Petr, in which a fair amount of the humor seemed to me rather idiosyncratic and even during the course of the rather short film, I was looking at the watch a few times. But in the last third of the film, you have a conversation between Petr and Bambas that really brings a lot of the film together. When I say conversation, I don't always refer to the exchange of words, but you essentially see the two men in common ground, reflecting on what unites them despite the disparity of their circumstances. There's no preaching here, and a fair amount of what happens is just the two guys getting drunk and making casual chatter. At one point they have the idea of running away from their existing lives and making a fresh start elsewhere. I'm not suggesting there that the film is like some puzzle with a revealing twist, but somewhere in the midst of this extended scene the threads of the film came together for me, and what seemed pointless before comes into context. So while initially I was very dubious about the DVD cover's claims of subtle humor, at the end I'm somewhat in agreement and I do feel that I can revisit the film with a better perspective the next time. Apparently Karel Blazek, the actor that played Bambas died very shortly after the film's completion of leukemia, of which the director was not aware until he died. I got this Kickstarter-funded movie through download as part of the Jim Guthrie Humble Bundle deal currently on. 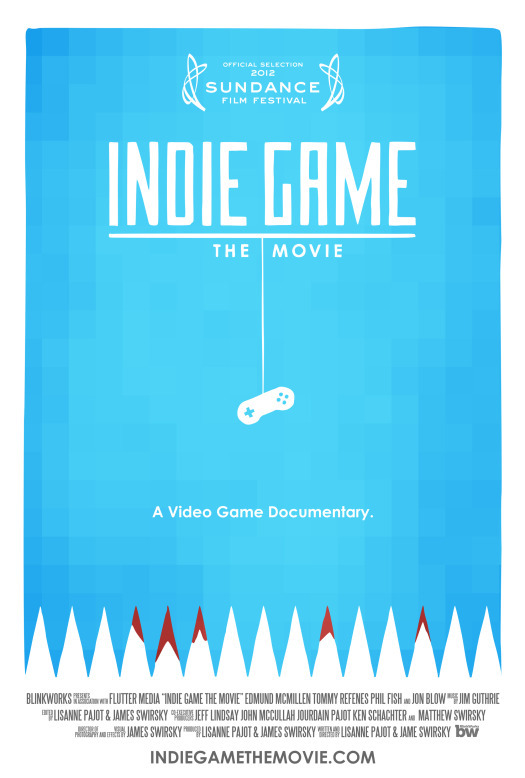 The film attempts to give an insight into the lives of independent game designers – their lives, their philosophies and how they differ from those employed in mainstream game developer studios. It covers in parallel the lives of three prominent indie game developers, the people behind Super Meat Boy (SMB), Fez and Braid. The first two games are given the closest attention as the film chronicles the time leading to the commercial release of SMB and the showing of Fez at the Penny Arcade Expo (PAX) convention. Braid is shown mainly in the wake of its success. I would assume that at least some part of the film is shot in retrospect since it is a little hard to believe that the camera was in position at all the crucial junctures of the development of these games. Although there is a fair amount of footage from the games explored, the film does not require you to be a game nerd to appreciate it. It's mainly a look at the personalities involved, what makes them tick, it's about what you face when you choose to travel off the beaten path. SMB developers Edmund and Tommy are a nice study in contrast. While Tommy is almost stereotype loner game geek coder (perhaps I'm being unfair, he does have a good vibe with his parents), Edmund has a wonderful open-faced smiling countenance reflecting his happy inner child (He looks rather like a younger Guillermo Del Toro). Some of the film's most touching moments come from scenes like Edmund's proposal to his supportive girlfriend at a gaming convention and when they reflect on the toll that SMB took on their personal lives. Phil Fish, the one-man developer of Fez is the other main participant in this film. He often comes across as a self-absorbed and arrogant man, with an almost 3DRealms-like reaction to fans criticizing the protracted (2007-12) development cycle of his game. He gets his moment of relief when Fez, despite game-crashing bugs received a positive showing at PAX 2011. While there are moments of repetition, it generally works in the film's favor in terms of depicting the routines and frustrations of indie game devs. 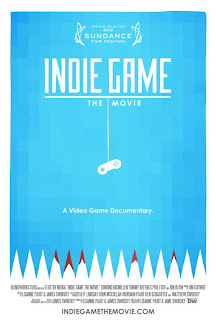 On the whole Indie Game – The Movie was a lot better than the Minecraft – The Story of Mojang documentary. The documentary was shot on digital video and the 1080p quality file I downloaded looks great within the limitations of the medium. The soundtrack by Jim Guthrie is also excellent and fits very well into the context of the film. Recommended even if you're not a big gaming fan.